This is not a criticism — this is actually a compliment. 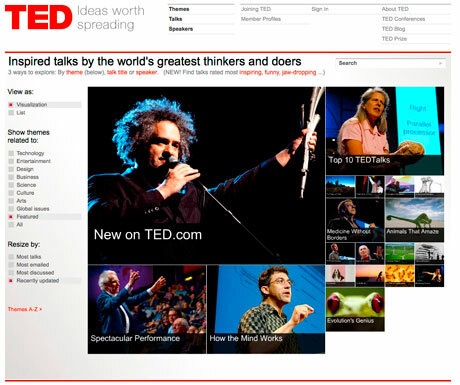 Ted.com does an amazing job making Flash relevant with this page design, using large images are very prominent business and social leaders to create a very visual experience. Select an option on the left (say, technology), and the page reshuffles like a tag cloud to present new speakers. They could have built this using DHTML — the page still would have been fairly heavy — but it’s really aimed at an audience that already has a fat pipe to serve up this content. Content can be ordered and sized by different faceted filters (woo hoo! ), and if the visualization mode is too much for you, you can resort to a list view (how Web 1.0). You can even view the number of comments and times each was emailed to friends. Another tip: it would be even cooler if the boxes could be dragged around and re-ordered to see certain topics large.